Arrupe Jesuit High School is dedicated to the service of families who are often overlooked, and left to struggle on the margins of society. Our school, however, is blessed by the opportunity to walk with wonderful students, and assist them in the pursuit of work that restores them to a vision of themselves that God originally intended. We strive to prepare students for a future they did not think was possible. In this work, our students draw strength from the greater community, from generous people like yourself who acknowledge their effort and who chose to support their future success. Your investment in Arrupe Jesuit confirms for students their value and validates their vision of who they are and who they can become. Thank you for joining us in this blessed mission. 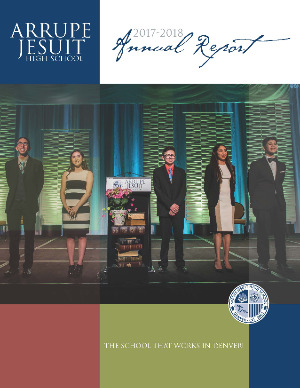 We hope you enjoy reading more about a great year at Arrupe Jesuit! Contact us for information about years prior to 2014-2015.